With an average of 100k readers and 1.2 million ad views each month, Diabetic Gourmet Magazine provides an ideal way to reach a targeted audience of people living with diabetes. 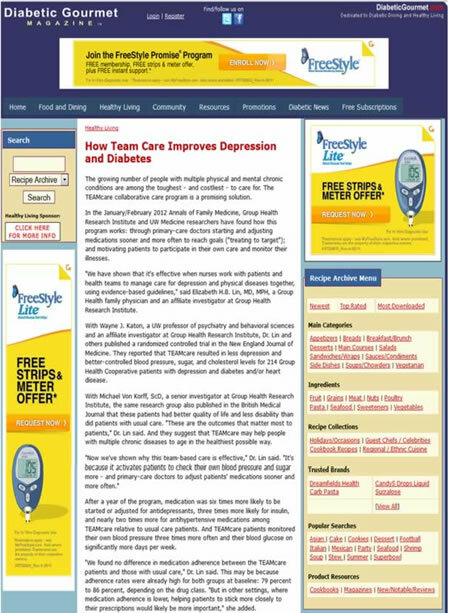 Our readers trust us to provide them with authoritative content, news and information through our network of diabetes-related websites and email newsletters and dispatches. This is an audience of people highly motivated to find low-carb and sugar-free foods, diabetes health-related products, and diabetes-related services. For an in-depth look at the promotional opportunities available, view our Online Media Kit or visit the links below. You’ll learn about all the advertising products we offer, including specifications, rates and special promotional offers. High-Impact ad units that can’t be missed. Leaderboard (top), Wide Skyscraper (left) and Medium Rectangle (right) are shown below.